I like to work with beads. It relaxes me, and I get to be creative in a right brain sort of way. I've made lots of bracelets and a couple of necklaces and tons and tons of earrings. It's been fun for me, and I usually give them away. But sometimes I decide that I want to make something just for myself, and I had grand plans of creating entire wardrobes of intricate and fancy earrings, just to be glamorous. I have a four year old boy. A four year old boy who is the equivalent of the Tasmanian Devil from Looney Tunes fame. If he's quiet, shenanigans are afoot. Fortunately, Zane always wants to be where I am. Unfortunately, Zane always wants to be where I am. Before I even got all the Legos cleared away from the table, my son was right next to me. He wanted to help, he said, and climbed into my lap. It is physically impossible to do any sort of beading with a wiggly child in your lap. Believe me, I have tried. I do try to be encouraging, patient. My husband is so good at that. I sat Zane in the chair next to me, and gave him some string and some plastic beads that I bought just for him. Soon he was happily stringing beads. I started again. I actually got to look at a bead or two before I have to stop. Zane was swinging the string of beads he made around his head very fast. "Zane, that is going to brea--" I didn't even get the sentence out. Beads flew everywhere in the kitchen. There was even a bead stuck in a cobweb in a corner, I'm sorry to admit. I yelled, Zane cried. I hugged him, and we discussed why it's not a good idea to swing a string of beads around. I tell him to pick up all the beads that he can see so people don't slip on them. "I can't," he says, then runs off. After another round of yelling and crying, Zane finally cames in and helps me pick up the beads. That done, I sat down again to work on my earrings, only to have Zane climb back into my lap with his computer. He wanted to show me the Green Ninja, I think. Is there a Green Ninja? Maybe I misunderstood. I moved Zane to the seat next to me, and try to work again, pausing every 4.7 seconds to answer questions or to "see" whatever it is that Zane wants me to see on his 'computer'. I broke three jump rings in a row and nearly took off a fingernail. The doorbell rang. I don't remember much after that point. But hey, I did finally finish the earrings! This sounds familiar! I let Zaid make paste on the floor the other day because it meant he wasn't hanging onto my leg. Yes, I had to scrub flour and water off the floor later, but you know what? I did it after he was in bed and not trying to help with that too and it was so worth it. Those few minutes made me calmer, gave me patience for when he threw a book at his sister's head during dinner. Ugh. I'm glad you were able to finish the earrings (but I did have to giggle at you getting it right and then bam! doorbell. Ha. Always something). 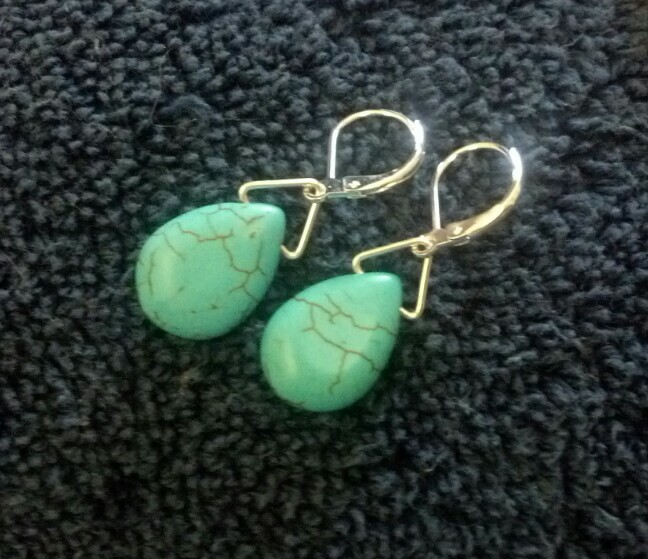 Lovely earrings, I love turquoise. beautiful earrings! thanks for sharing them with us! The earrings came out so beautiful---despite everything! I just took my first beading class yesterday and made a bracelet. Fun. Great earrings. I hope that you can find more time to craft! I love your earrings, but it must certainly be a challenge to work on something so small and intricate with a four-year-old. Glad you finally completed them. I've considered beading, but I'm into so many projects, it would be just one more thing to take up my time, money, & space. But it would be nice to be able to make something that matches a particular outfit. Yet, being retired, I don't wear much jewelry anymore because more often than not, I'm just bumming around the house. Oooh, those are pretty! Years from now you will still have the "fun" memories of making them!